Small Town Marketing: Is Facebook Ripping off Small Businesses? Is Facebook Ripping off Small Businesses? Many small businesses are feeling the push to develop a social media presence. Unfortunately, quite a few businesses just don't have the time, money, or resources to dedicate to social media. So a lot of businesses will set up profiles, post a few things to get started, and then realize they aren't getting the likes or engagement they had been hoping for. So they put a little money into Facebook advertising to promote their page. Giving Facebook ten bucks to promote their page compared to the thousands of dollars some businesses spend on TV commercials or newspaper ads is chump change. I used to believe this was a great idea. It was cheap, simple, and fast. If your attention span didn't last the full 9 minutes, like a lot of people these days, let me try and sum it up for you. Facebook is ripping you off. There ya go, simple as that. Here's the end of my blog....just kidding! 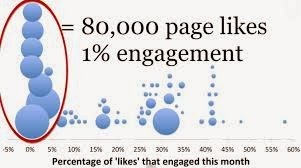 Many people were starting to wonder what is the value of a like on Facebook? Which if you are spending $100 to promote your page, it's a good question. So a man named Rory Cellan-Jones from BBC, set up a Facebook page called Virtual Bagel. This is a page where they would send you a bagel via the internet, you then download and enjoy. Quite the ridiculous page, I know. "A click farm is a form of click fraud, where a large group of low-paid workers is hired to click on paid advertising links for the click fraudster (click farm master or click farmer). The workers click the links, surf the target website for a period of time, and possibly sign up for newsletters prior to clicking another link. For many of these workers, clicking on enough ads per day may increase their revenue substantially and may also be an alternative to other types of work. It is extremely difficult for an automated filter to detect this simulated traffic as fake because the visitor behavior appears exactly the same as that of an actual legitimate visitor." Sounds like a great internship right? This type of practice is obviously forbidden by Facebook. Instead, they offer the right way. Which is giving them money to advertise your page. That is how Virtual Bagel received its likes. Jones paid $100 to Facebook and the likes started rolling in. Within a day he had around 1,600 likes, mainly from developing countries like the Philippines or Bangladesh. He noticed two things: 1. The profiles of the people who had liked his page were suspicious, mainly because they had usually liked close to 800 pages. 2. Even though he had all of these likes, there was no engagement. So if you're getting likes the right way by paying Facebook and only targeting people in your local area, why are you not receiving more engagement from your fans? In a stunning article from The Next Web entitled, "Like or Lies? How perfectly honest businesses can be overrun by Facebook spammers," they revealed that those click farms we discussed earlier aren't just liking pages they are being paid to like. They're liking other random pages so Facebook doesn't pick up on them. Because if they liked a lot of pages in the same place in a short amount of time, that would be suspicious, but if they like pages all over the world it is a lot harder to track. Facebook could be nice and actually delete the fake likes, but then they would actually lose money. Because right now a small business could be paying to promote their page, but then when they don't see any engagement they pay again to promote the post. So Facebook is actually making double the money. So what can small businesses do? Nothing. Unfortunately, until Facebook starts to receive a bunch of complaints they probably won't do anything. So I recommend saving your ten dollars and just invest your time in quality content that real people will actually like and share. I know it's not easy, but it's better than completely ruining you Facebook presence with fake likes! Stay tuned for my next blog post where I interview Tara Pickering the Manager at Miss Wonderful in downtown Cedar Falls!